Hello friends. So I've joined in with some lovely ladies, whom all have gorgeous blogs, to share how we create functional yet beautiful boudoir areas. If you've come over from my lovely friend Summer at She Leaves A Little Sparkle and you're new to MOTH Design, thank you so much for joining me. I'm touched by this wonderful group of ladies and their gorgeous blogs. There's something so incredibly enjoyable about displaying the things you use everyday in a beautiful way. When it comes to our personal spaces in our homes we often overlook styling the more private areas that visitors don't see. However, putting some extra effort into organizing the things we use everyday can turn the ordinary into extraordinary. 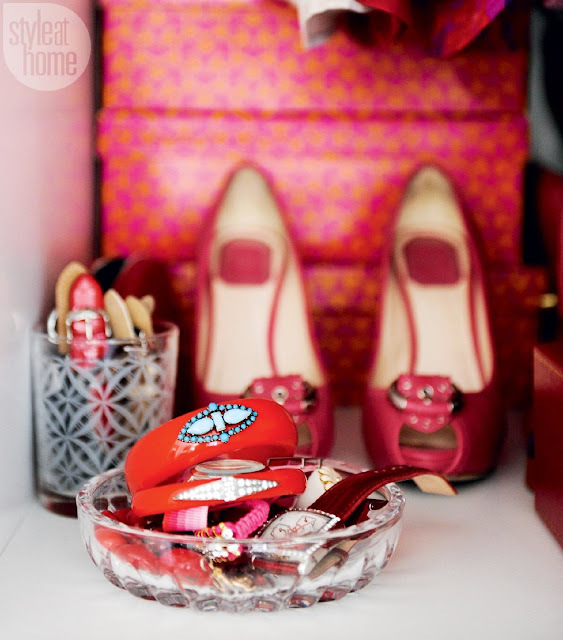 My closets were shared with Stye At Home in their designer secrets issue not too long ago. When I put these spaces together I divided them by a bright closet and a black and white one to create two striking dynamic spaces. Here is a side by side. 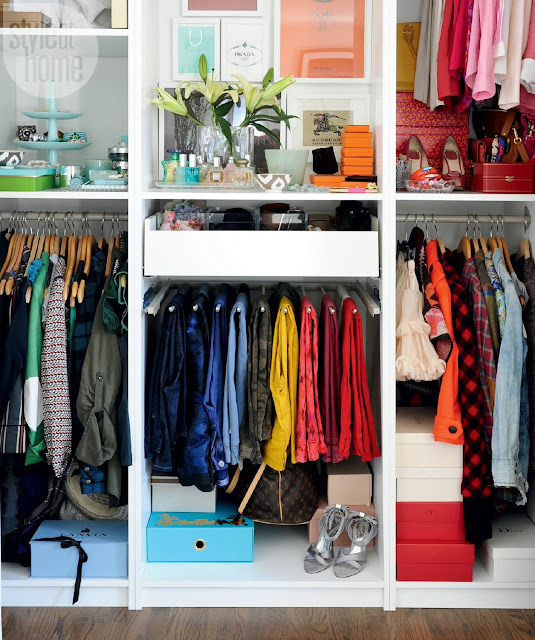 I found it easier to sort all wardrobe items out by colour rather and I loved the striking visual it created. I've used pretty little crystal candy dishes and antique silver trays to show off and contain perfumes and jewelry. Another trick, I've always liked to use items for purposes other than they were intended when it comes to display. For instance, I keep my watch straps in an old candle jar. It's pretty and practical at the same time by making use of something that would otherwise be garbage. 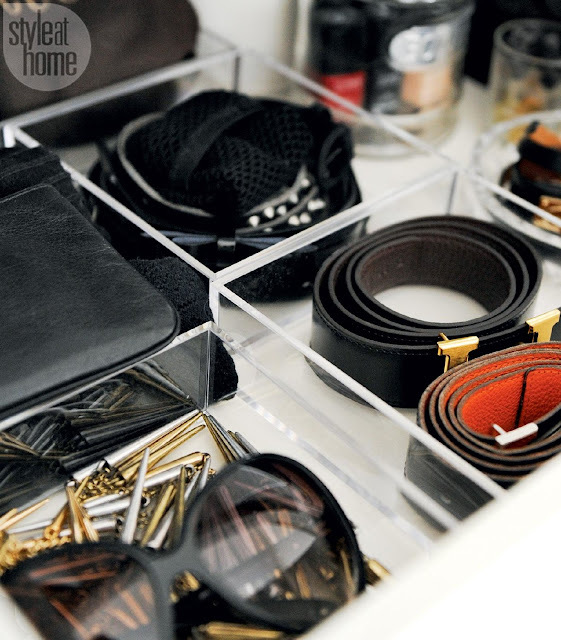 Little square lucite organizing trays keep belts and other goodies in their place and quick to find. YOUR CLOSET IS AMAZING ERICA!! Loving the way you have everything organized. I feel inspired! I've never before had so much closet and clothes envy. Your home is just too beautiful! I love your classic style. It's so fresh, modern and super chic! What a wonderful way to organize all of your beautiful accessories!! I need to organize may space too. 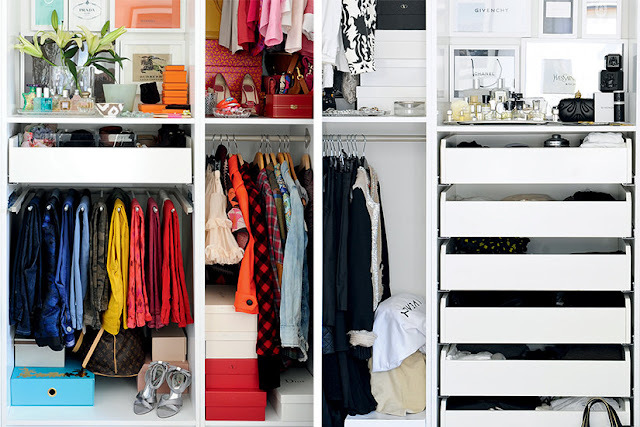 Inspired post with a lot of great idea for a well organized closet.